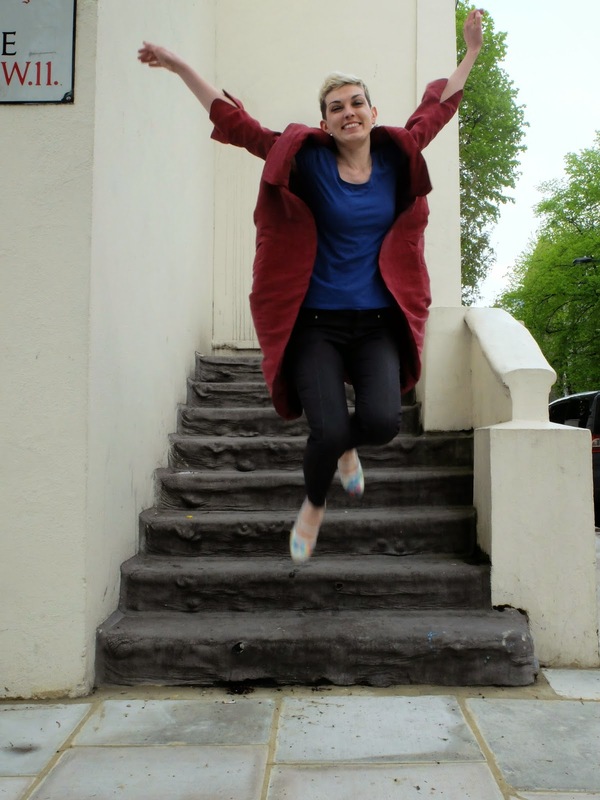 Google Thewallinna and other creatures: Escaping with my cocoon coat! 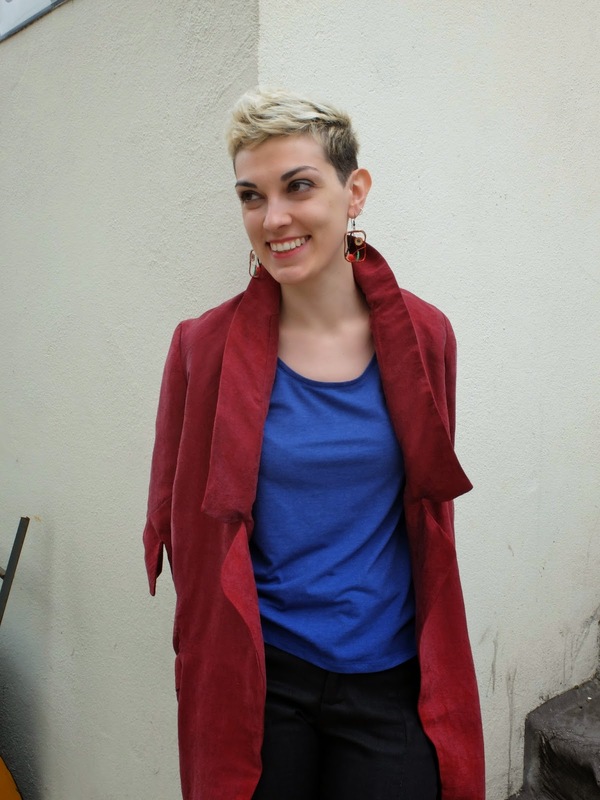 My handmade collection has a new addition, a silk cocoon coat by Ralph Pink. This coat is probably the most ambitious garment I've ever made both technically and time-wise: it took me 10 weeks to complete. Since I've discovered and tried to sew Ralph Pink's patterns, he's become one of my favourite indie pattern designers. Why? His collections are very modern and edgy. Besides, the instructions are super clear and, accompanied by detailed technical drawings, are super nice to work with. For the execution of this coat, I used 4.5 metres of sand-washed silk as the fashion fabric, 2 metres of silk parachute for the lining and approximately 1.5 metres of silk organza for the underlining. The creative process included hours of hand sewing. 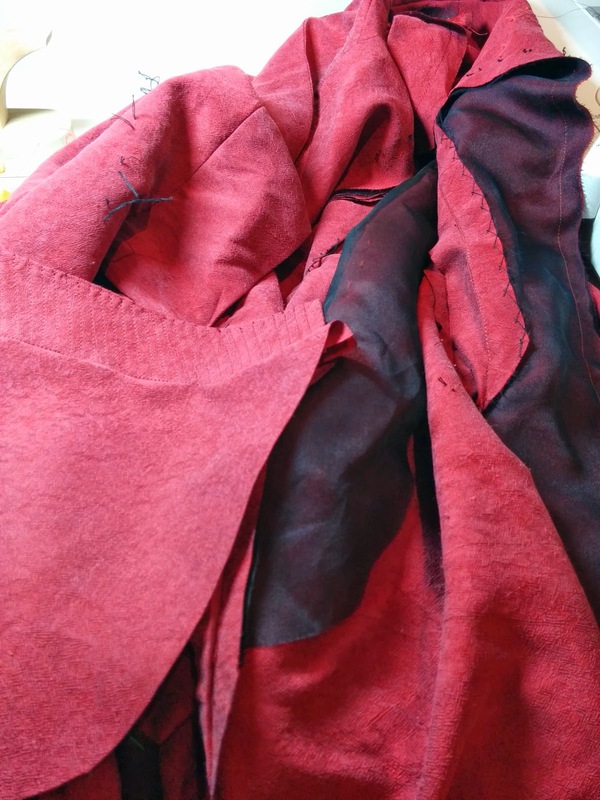 I used tailor tacks to transfer all of the pattern pieces onto the silk, catch-stitched most of the seam allowances to the silk organza and also attached the sleeves' lining by hand. A couple of hours went into top stitching the sleeves and back panel. Unfortunately, it does not show very well in the photos. I've never worked with so much fabric before, including very long pattern pieces and also pieces with many corners. 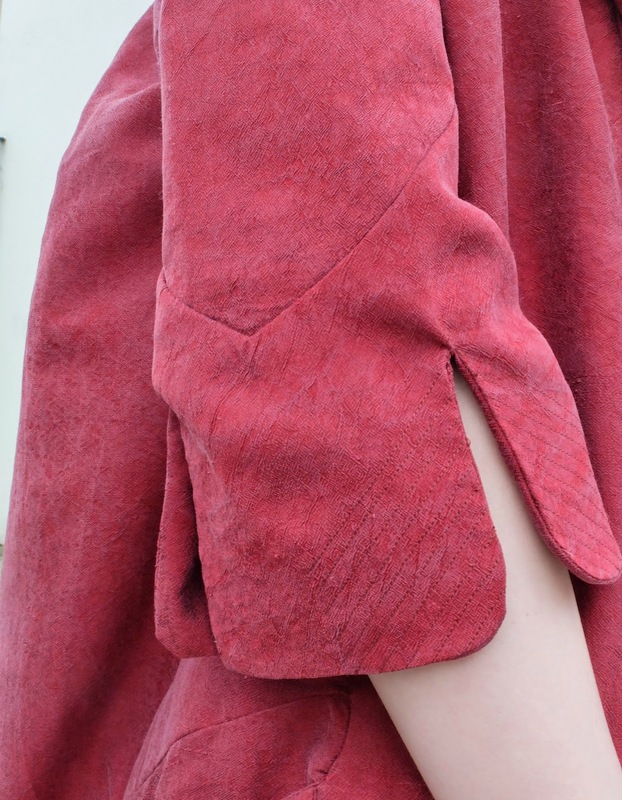 I probably don't have to tell you that while working on the coat, I went through different phases from liking it to hating it to loving it again. Now that the coat is done, I think it's kind of chic and makes a statement. By the way, the pair of jeans I am wearing is my first attempt at the Jamie Jeans. As I explained in my previous post, I did not like this pair because of the fabric's quality. But hey, they are pretty wearable! Last but not least, I wanted to update you on my personal situation. After spending six months in London, I've decided that it's not my cup of tea. So next week I'll fly over to Dublin! Thankfully, I was able to find a new role within my company which definitely helps when you start your life in a new country. EXCITED!!!!! I used to live in Dublin for three years before I moved to Tokyo. Before that, I did not appreciate my life in Dublin to the fullest, but at this stage, I feel that Dublin has a much better quality of life than London. So, I am really looking forward to the move and unpacking boxes! And if, by any chance, you are a sewer or a blogger from Ireland, please do contact me! It'd be so much fun to sew and hang out together! I'll see you in a month or so! My friends live in Dublin now and we've been thinking about visiting them some time in Autumn. If you're still there by that time we may have that karaoke night out! ^^*~~ (if there are any karaoke bars in Dublin... ^^). Anyway, good luck on your move and read you soon! Oh Joanna! Of course I will be in Dublin in August! I plan to stay there for a few years, no more crazy moves! And you are more than welcome to stay in my house because I plan to rend a 2-bedroom house/apartment. Thank you very much! I have a place at my friends's house but I'll keep your offer in mind just in case. *^v^* And I mean Autumn, not August, because in August I am going to.... Tokyo for one month!!! *^0^* At least, that's the plan for now. Still keeping it a secret a bit, because nothing has been arranged yet, but our minds are set on this. what a great look on you, such an interesting pattern. You are the only person I have seen sew up those Ralph Pink patterns. they suit you. And Dublin - exciting. I love Ireland, every part. (have been twice) and I always tell everyone the food there is fantastic and other Americans say "really?" in a very disbelieving way - but I found it great, lots of fresh ingredients, the butter is the best. Have fun and I look forward to your adventures there. INNA! This coat is FANTASTIC! Holy crow, girl, it's so fashion-forward and soooooooo luxe! Absolutely fab! I'm so excited to hear about your move, too! I've always liked the idea of moving to Dublin, but sadly, my line of work isn't an easy one to travel in. Good luck and congratulations! That's an amazing coat! Wow! Wow! You look amazing in this, it's a work of art! I love a challenging sew and this definitely looks like a project you've invested a lot of time in. Fantastic job. Great to know Ralph Pink's instructions are good too, his patterns are definitely on my to make list now. Good luck with the move to Dublin, hopefully see you again whenever you visit London in the future! This coat is AMAZING! I had my eye on this pattern since you introduced me to Ralph Pink in the past. 10 weeks of sewing...not sure if I have a patience for it, but the result is awesome. Great job! Wow what an epic garment, good job!! Looks amazing. Good luck in Dublin, just make sure you keep blogging your awesome makes! What a luxurious statement coat!i love the hem swoop! That. Is. Amazing. I love the topstitching! This is an amazing work, your coat is unique and fantastic! You look absolutely fabulous in it. Good luck on your move! KIND of chic?! WOMAN YOU ARE THE DEFINITION OF CHIC EDGY AWESOMENESS IN THIS BEAUTY!! super amazing - this is a memorable and precious piece! Great job! Wowee! What a beautiful coat! That colour is perfect on you & it looks like a dream to wear all that silk! Good luck with the move to Dublin & hopefully we will (finally!) have that drink there! Your coat is stunning! Wow. It looks different and awesome in every photo you shared. I really like the top-stitching, too. What a great plan :) I bet you are excited! In any case, let's keep in touch and we'll figure everything out when the time comes. Oh, those Irish farmer markets are the best: fresh bread and butter, fish and oysters.... yummy! I am really excited to go back! Once I am there, I'll definitely make more garments from Ralph Pink patterns. I would also recommend you to give them a go! With your incredible sewing skills each of his patterns would transform into a gem. Thank you so much! RP patterns are difficult to resist! hehe :) Don't know about modeling but will be making more of them! Thank you, Pauline! Good luck with the move. I really hope it works out for you. I love this coat. The construction is exquisite and the fabric just lovely. The result is stunning. Thanks a lot, Stephanie! I am really looking forward to seeing you in Dublin!!! So do you! I like your new hair! Fiona, you should try RP patterns for one of your Mood projects! 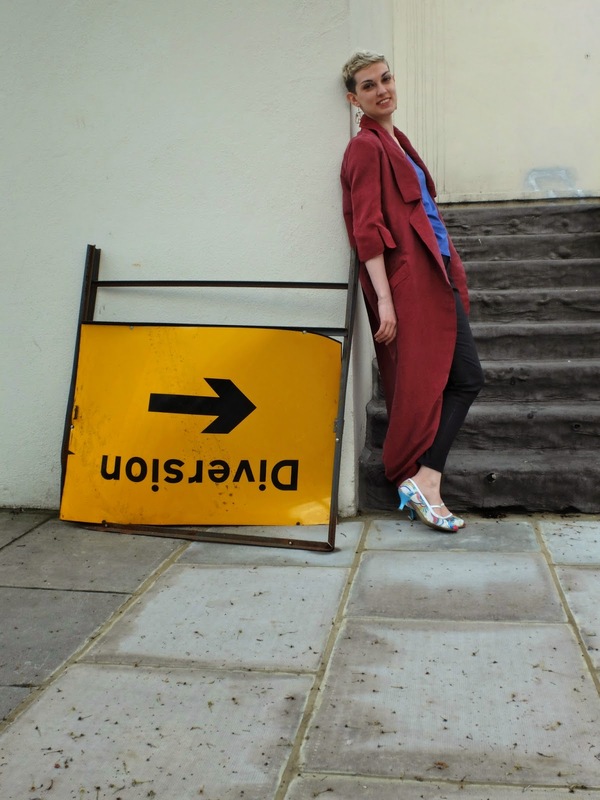 To be honest with you, I am happy to move to Dublin but I will miss the London sewing community! So do expect me for one of the next meet-ups! 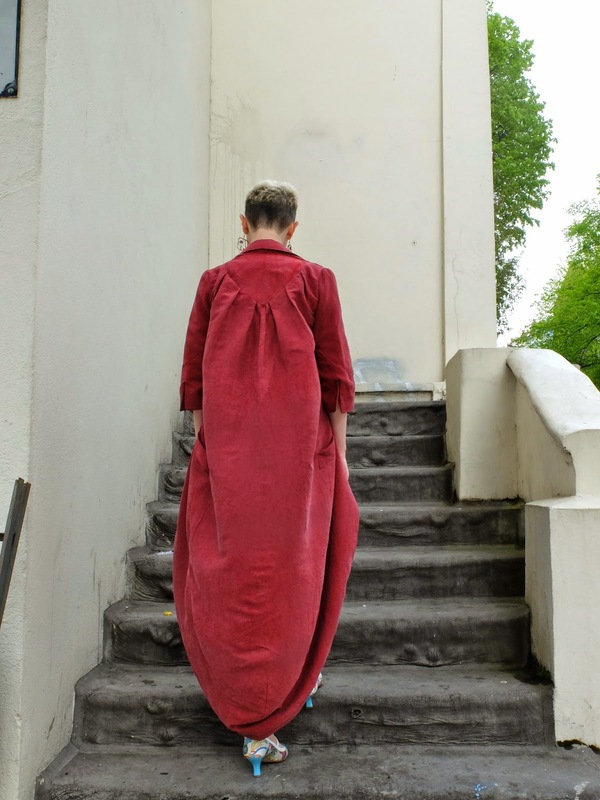 With your amazing skills and years of practice you would finish this coat in no time! Thank you so much, Bella! I will! You receive an Oscar for the best comment! хехе :) Как вам живется в Канаде? Уже прижились? It would be great! Just give me a shout! Thank you, Kirsty! Despite taking such a long time to complete, I enjoyed the experience. But maybe my next couple of projects will be simpler :) I hope to see you somewhere in Europe soon! Thanks! I lost patience a few times while top-stitching :) Hopefully, it paid off. Good luck in your new city!!! Your fabric choice is awesome, I love it! I have just finished my jamie jeans and they are wearables but I have to sew a new pair. Congratulations on the new job and new city! I totally agree that Dublin is much better. London can get so tiring! That coat is totally you...I can't believe your patience. Well done, Inna. That is a truly fabulous coat and you look fantastic in it. Nice to see something really original! Great work. Fabulous coat! Good luck with the move. Oooh clever clever clever! I love your coat! I love cocoon coats, and in fact was desparate to make a boxier wool one for winter this year...which passed in 1mth for me (moving countries and all). I love that your coat is made of silk...I may steal that fabulous idea. Oh, Maider! Your Jamie Jeans rock'n'roll! I love the fabric so much! You made me want to make more Jamie Jeans, but my sewing machine is still in the boxes .·´¯`(>▂<)´¯`·. Hi Gail! I'd like to see what pattern you have chosen for your daughter! Wow wow, I just came across this and I am just in love. Dramatic coats are the best! I cut this pattern but the shorter length and now I am rethinking it. This is so worth all the work--stunning! I'm just getting ready to start work on this coat. I'm so glad I found yours. It's gorgeous! Thanks, Leila! I wore it all last season and I wear it every day now. I could not recommend this pattern enough!